Markov jump systems are a kind of multimode systems which have been studied in lots of literatures [66, 206]. However, it is difficult to obtain complete known transition probabilities in practice even impossible. Therefore, analysis on Markov jump systems with incomplete transition descriptions is an interesting problem. A robust controller has been designed for a kind of Markov jump DOSs with actuator saturation in . 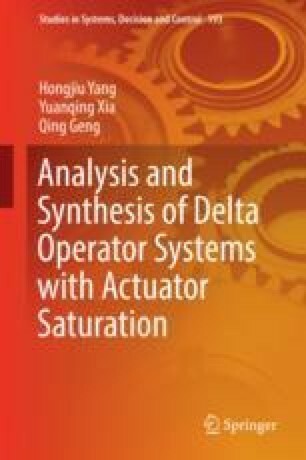 An adaptive sliding mode controller has been designed for spacecraft systems with actuator saturation . An exponential stability condition has been derived for time-delay systems using a weighted integral inequality approach in . Due to promotion of above results, analysis of systems with time-varying delays and actuator saturation has attracted widely attentions.